Given the inextricable link between Istanbul and the Bosphorus, as well as the seas that lie on either side of the enduring strait, the theme of this year’s Biennial – ‘Saltwater: A Theory of Thought Forms’ – seems especially apt. Salt water and the contrasting image-forms of knots and waves can be related in so many ways to Istanbul’s past and present. With such a broad base to jump off from, this sprawling, all-encompassing Biennial – not unlike Mother Ginger and her massive skirt – has room for a wide range of subjects under its conceptual umbrella. It also makes sense that, based on its focus, the Biennial is staged in venues all over the city. As the curator Carolyn Christov-Bakargiev writes in her introduction, ‘You will spend quite a bit of time on salt water. There is a slowing down of the experience of art due to the travel between venues, especially on ferries.’ Imagine it: just as you’re contemplating the myriad conceptual offshoots of salt water on a ferry ride over to the Princes Islands, you will also be experiencing a very physical, very tangible interaction with this same material. See what I mean by all-encompassing? While I have yet to experience the physical act of moving across waterways to different Biennial locations, I was able to visit two of the largest venues: Istanbul Modern and ARTER. There was definitely a tilt toward the scientific at both locations, especially ARTER, where the works on display form a cohesive narrative revolving around waves as they relate to time and space. 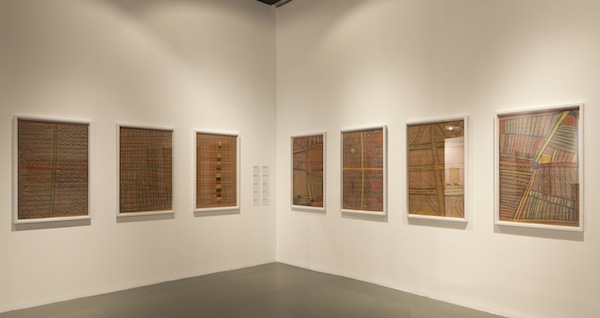 As for Istanbul Modern, the pieces I found the most captivating were those that delved into the memory and structure of communities, especially minority communities, and how they’ve changed over time. Two of the most striking installations, which just so happen to be prominently exhibited in the central area of the museum floor, consist of sculptural works that speak to the cycle of construction and destruction. 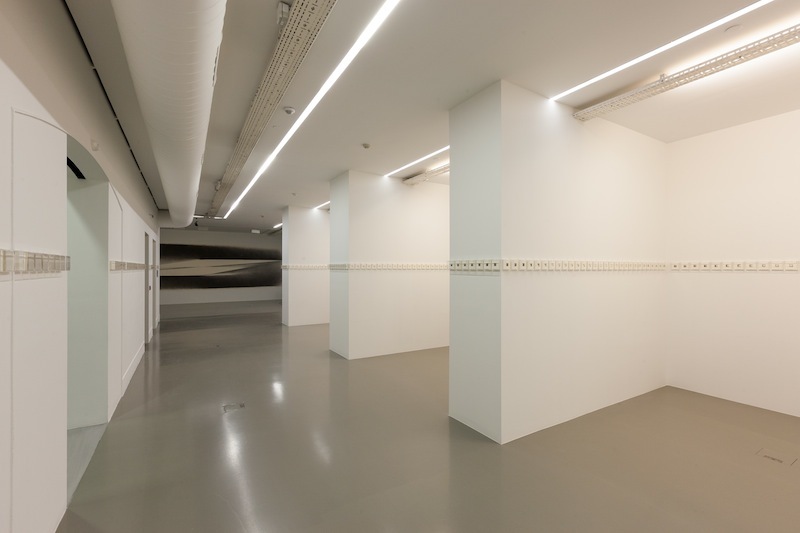 Marwan Rechmaoui, a Lebanese artist, was inspired by the geography and history of Beirut to create a series of more than ten concrete pillars, the basic structures of urban architecture. With pieces of rebar jutting out and pockmarked concrete, these pillars look as if they have been battered to the point of exposing their innards. Yet although they may seem like bombed-out, crumbled ruins, there are traces of residential buildings embedded in these pillars, such as plants and wicker baskets. There is an element of life and growth in the carnage. 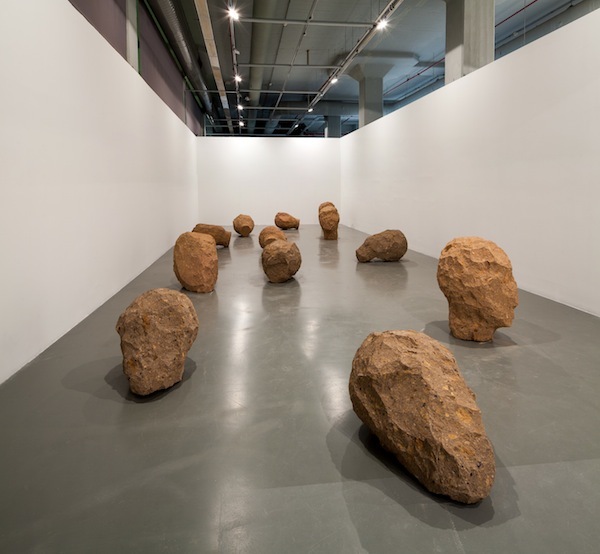 Another installation that spoke of both decay and the stubborn will to remain is Sonia Balassanian’s work Silence of Stones (2015). Consisting of 12 large, roughly hewn sculptures with the shape of severed heads, the work speaks foremost of decapitation. Some of the abstract heads, made of Tufa stone from quarries found on the Armenian side of the border with Turkey, lie on their sides, some stand tall; all are a silent statement on bodies of land and rock and flesh. According to the artist, these sculptures refer to those Armenian intellectuals who were arrested and murdered in April 1915. Yet at first glance, they are reminiscent of the heads at Nemrut Dağı that stand in remembrance of and dedication to a lost ancient kingdom – not unlike Balassanian's heavy sculptures. Questions of memory and remembrance of the violence perpetrated against the Armenians in 1915 feature prominently at Istanbul Modern. Aslı Cavuşoğlu’s installation Red / Red (2015, main featured image) – so far one of my favourite pieces of the Biennial – focuses on two different red pigments as a way to explore how cultural and historical facts are represented and transformed. 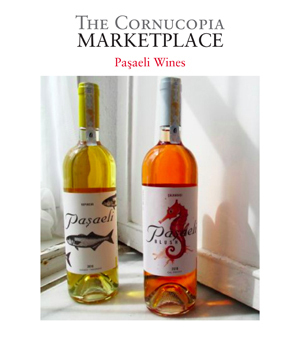 One of the pigments, a lighter red, is traditionally made from an insect known as the Ararat cochineal (Porphyrophora hamelii). 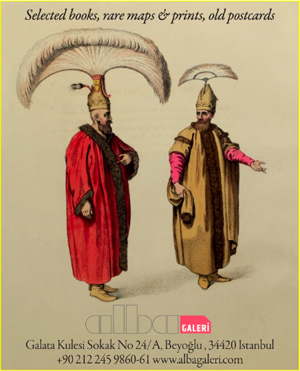 This red represents a lost history in Armenia, where the formula for extracting the colour remains a secret. In Cavuşoğlu's paintings and sculptural books, this carmine pigment is juxtaposed with another, more enduring red, the brighter one of the Turkish flag and a common colour in Turkey. It’s interesting to note that she uses the fading red pigment, which seems doomed to vanish, to paint mainly flora and fauna, an action which reinforces her attempts to hold onto and document that which is subject to the recurring cycle of life and death, rise and fall. The Armenian-Lebanese painter Paul Guiragossian’s 14 modernist abstract paintings, while more an exploration of colour and form, evoke the grief and mourning of exile. A child of survivors of the Armenian genocide, Guiragossian paints bands of colour in such a way that each brushstroke becomes a pillar of humanity, and the adjacent bands and strips clearly represent a cohesive group or family. While the plight of the Armenians is a significant part of Turkey’s past and present, and thus an obvious topic for Istanbul’s Biennial, issues of communal memory are further elucidated by the series of works related to the Yirrkala aboriginal community in northern Australia. The drawings of the Yirrkala people, made in 1947 with crayons and graphite on brown paper at the behest of a visiting anthropologist, show the geography of their land and waterways, as well as their community’s laws. At first glance they appear as simple patterns, almost like something a child would draw. But once you understand that they are mapping out their land, its coastlines and maritime passages, you see them for what they are: sophisticated narratives of ancestral creation and everyday life. Just as captivating are the paintings of Djambawa Marawili, who is of the Madarrpa people and lives three hours by road from Yirrkala. The colourful creations painted on large pieces of bark tell tales of the sea, tides and currents, which come together in fluid forms. These paintings and drawings made by aboriginal communities in Australia are juxtaposed with Vernon Ah Kee’s video installation Tall Man (2010), which uses found footage to examine race relations in that country and beyond. The subject of the video is the 2004 Palm Island riot, which erupted after an indigenous man was killed by white police officers stationed on the island. 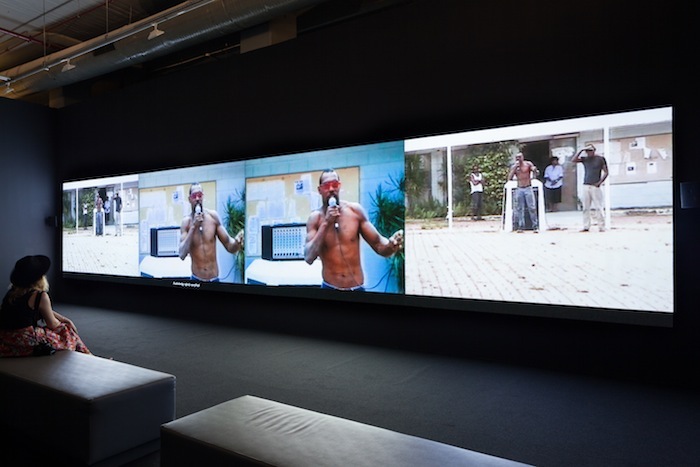 The structure of the four-channel video installation, with its short, quick shots from different perspectives, flawlessly recreates the tension that quickly mounts in the lead-up to violence. It’s interesting to note that while conducting a site visit for this installation, Ah Kee became aware of the memories surrounding the past trauma in eastern Anatolia. 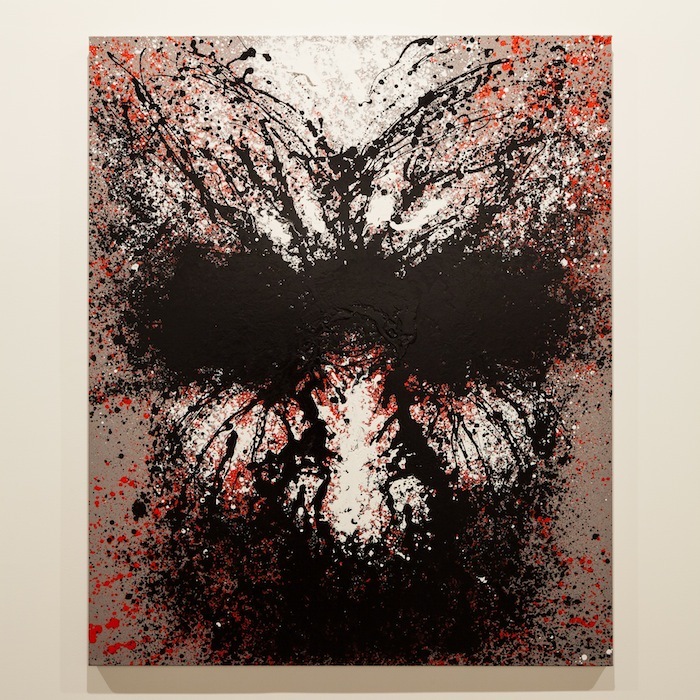 As a result, he created a series of five new paintings entitled Brutalities (2014–2015), which are both portraits and investigations of those who perpetrate violence and ethnic cleansing. 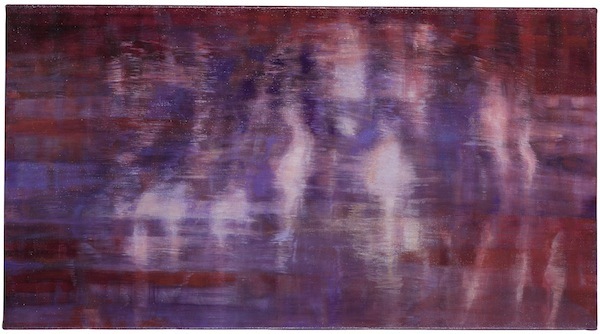 While up close the paintings appear to be abstract, violent splatters of paint, faces emerge when viewed at a distance. The Biennial works on display at ARTER were very much informed by space and time. Each floor featured a work of Fredrik Carl Mulertz Stormer, a Norwegian scientist and photographer who studied the aurora borealis. Stormer’s scientific work – he developed a camera that could capture photos of the Northern Lights, which allowed him to determine that they are a solar phenomenon – is fascinating, but it is the objects and photographs on the first floor which tell the most interesting story: one of a man both determined and thorough, who was not just a scientist, but an artist with a keen eye and an interest in documenting life as he saw it. The real gem of ARTER, though, is found on the second floor. Christine Taylor Patten’s installation micro / macro: 1001 drawings (1998–2015) fills the room with one massive 7 x 24 foot drawing and 1,000 1 x 1 inch drawings made by black ink on paper. Exploring the infinite possibilities of the line, Patten’s drawings unfold from an initial dot or point, and grow into irregular, organic wave patterns. The vast scale of the work speaks to the expanse of the universe, and the way in which it is built on the smallest particles. Following the almost completely straight, unbroken row of tiny drawings on the wall, I was mesmerised by the way the humble line could have such massive consequences. While it may be tempting to spend your entire visit getting stuck into Patten’s work, the paintings of Bracha L Ettinger on the third floor should not be missed. 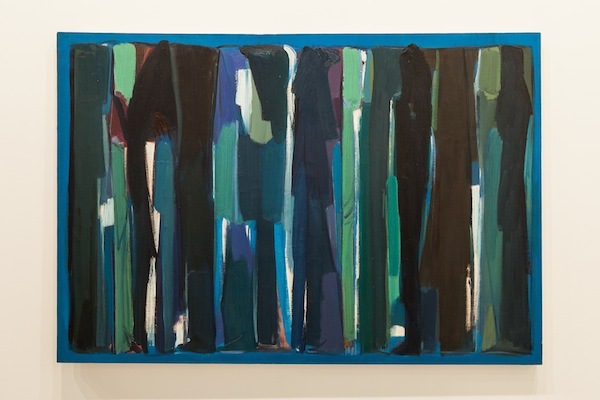 More compelling than her journals or audio installation, the paintings on display feature layers upon layers, almost as if Ettinger is trying to obfuscate. With each slight shift in position, something new presents itself. Just when you think you’ve teased out all the layers, you catch a glimpse from a new perspective and you’re drawn right back in. All photos have been provided by IKSV. Stay tuned for more instalments of our Biennial review as we cross the seas (and the street) to see the installations on the Princes Islands and at the Galata Greek Primary School.